Scientists completed one of the most detailed explorations inside the Great Blue Hole. Here’s what they found at the bottom of the giant, mysterious sinkhole. The Great Blue Hole is a massive underwater sinkhole that lies off the coast of Belize. Scuba divers and snorkelers have been cruising the surface waters for decades, but very few explorers have dared to venture deeper and explore what lies at the bottom. In the winter of 2018, a crew from Aquatica Submarines ventured to the bottom of the Great Blue Hole and made some unexpected discoveries. Narrator: There’s a massive underwater sinkhole off the coast of Belize that extends 125 meters into the Earth’s crust. It’s called the Great Blue Hole. Scuba divers and snorkelers have been cruising the surface waters for decades, but few have dared to venture deeper and explore what lies beyond the blackness. In the winter of 2018, a crew from Aquatica Submarines started their descent to the bottom of the Blue Hole. Their mission was to create a 3D map of the sinkhole’s interior, but along the way, they came across some common and not-so-common sights. As the crew started, they found the usual suspects: reef sharks, turtles, and giant corals. But as they pushed 90 meters, life started to vanish. The culprit was a thick layer of toxic hydrogen sulfide spanning the width of the entire sinkhole like a floating blanket. Erika Bergman: Underneath that there’s no oxygen, no life, and down there we found conchs and conch shells and hermit crabs that had fallen into the hole and suffocated, really. Narrator: Past the conch graveyard and toward the bottom of the hole, around 120 meters deep, the team found something they did not expect: small stalactites. The surprise gave scientists clues to the hole’s ancient past. Bergman: Stalactites can only form because water is dripping down stone. And so we know that this was a big, dry cave, and it was during a really prolific era on Earth, so there were probably lots of stuff living in it. Narrator: Scientists think the cave formed during the last Ice Age, which ended about 14,000 years ago. That’s when sea levels began to rise, and the cave flooded and collapsed, leaving behind the Blue Hole we see today. Researchers think that other marine sinkholes, like Dragon Hole in South China Sea, and Dean’s Blue Hole in the Bahamas probably formed the same way. As the scientists continued down the hole, they found another clue to the past: a light buildup of silt on top of the conch graveyard. Bergman: The silt itself on the bottom is a pretty good record of all of the different hurricanes and storm cycles and glaciations that have happened, so we can see that right around the time of the Mayan collapse, there were huge, huge storm cycles followed by very significant droughts. Narrator: As the team continued to explore the bottom of the hole, they found a 2-liter Coke bottle and a lost GoPro containing some vacation photos. But that wasn’t all. Bergman: We did encounter two of the probable three people who have been lost in the Blue Hole, so we found kind of the resting place of a couple folks, and we just sort of very respectfully let the Belize government know where we found them, and everyone decided that we would just not attempt any recovery. It’s very dark and peaceful down there, just kind of let them stay. Narrator: Scientists predict this hole won’t be around forever to explore. Every day, waterfalls of sand fall into it, slowly filling it up like an underwater hourglass. But as for now, we can still admire its beauty and study its many mysteries. It turns out astronauts aren’t alone on the International Space Station. A new study reported by Gizmodo found that a “diverse population of bacteria and fungi” populate the ISS based on 14 months of research. The results, published in the Microbiome Journal, conclude that “intact/viable bacteria and fungi found on surfaces in closed space systems” have been effectively cataloged for the first time, which could be used to create safer and cleaner conditions for future space missions, including those to Mars. Additionally, the findings might be vital in the understanding of “confined built environments” on our own planet, such as medical and pharmaceutical clean rooms, according to the study. For the experiment, eight different locations aboard the ISS were tested over three flight sample sessions in an effort to determine which microorganisms can populate in a closed space. To find this, surface wipes from each room were treated with propidium monoazide (PMA), a chemical compound that helps determine the DNA of the bacteria present in the microbiome. Other wipes were left untreated. Many of the organisms detected were seen as harmful to astronauts because they contain properties that resist antibiotics. Some of these bacteria include Acinetobacter, Sphingomonas and Bacillus — and fungi such as Aspergillus, Cryptococcus, and Rhodotorula. Unsurprisingly, astronauts were to blame for some of the bacteria and fungal cultures on the ISS. An abundance of human-associated organisms discovered include Staphylococcaceae — which originate in the skin and in the nasal passage — and Enterobacteriaceae, which comes from the gastrointestinal tract. 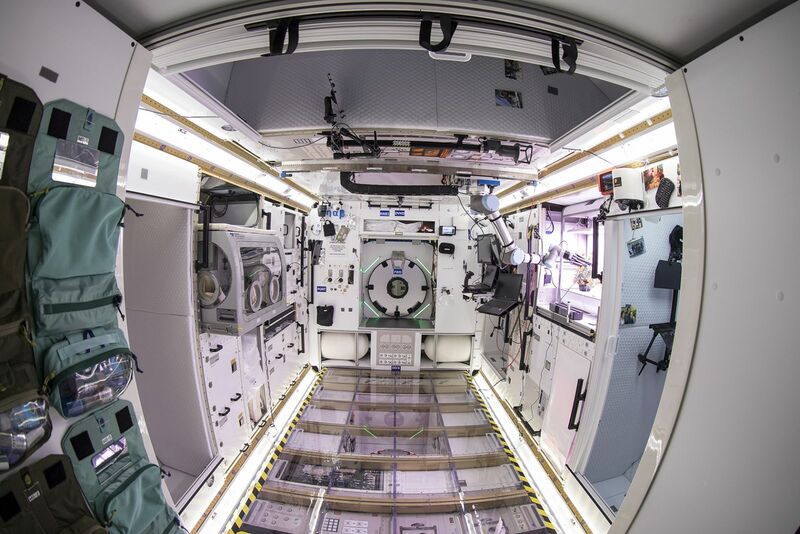 Prior to this study, many of the bacterial cultures on the ISS were largely unknown — most could not be determined by traditional methods such as petri dish growth. On its final flyby of Saturn’s largest moon in 2017, NASA’s Cassini spacecraft gathered radardata revealing that the small liquid lakes in Titan’s northern hemisphere are surprisingly deep, perched atop hills and filled with methane. The new findings, published April 15 in Nature Astronomy, are the first confirmation of just how deep some of Titan’s lakes are (more than 300 feet, or 100 meters) and of their composition. They provide new information about the way liquid methane rains on, evaporates from and seeps into Titan – the only planetary body in our solar system other than Earth known to have stable liquid on its surface. Scientists have known that Titan’s hydrologic cycle works similarly to Earth’s – with one major difference. Instead of water evaporating from seas, forming clouds and rain, Titan does it all with methane and ethane. We tend to think of these hydrocarbons as a gas on Earth, unless they’re pressurized in a tank. But Titan is so cold that they behave as liquids, like gasoline at room temperature on our planet. Scientists have known that the much larger northern seas are filled with methane, but finding the smaller northern lakes filled mostly with methane was a surprise. Previously, Cassini data measured Ontario Lacus, the only major lake in Titan’s southern hemisphere. There they found a roughly equal mix of methane and ethane. Ethane is slightly heavier than methane, with more carbon and hydrogen atoms in its makeup. Adding to the oddities of Titan, with its Earth-like features carved by exotic materials, is the fact that the hydrology on one side of the northern hemisphere is completely different than the that of other side, said Cassini scientist and co-author Jonathan Lunine of Cornell University in Ithaca, New York. “It is as if you looked down on the Earth’s North Pole and could see that North America had completely different geologic setting for bodies of liquid than Asia does,” Lunine said. On the eastern side of Titan, there are big seas with low elevation, canyons and islands. On the western side: small lakes. And the new measurements show the lakes perched atop big hills and plateaus. The new radar measurements confirm earlier findings that the lakes are far above sea level, but they conjure a new image of landforms – like mesas or buttes – sticking hundreds of feet above the surrounding landscape, with deep liquid lakes on top. The fact that these western lakes are small – just tens of miles across – but very deep also tells scientists something new about their geology: It’s the best evidence yet that they likely formed when the surrounding bedrock of ice and solid organics chemically dissolved and collapsed. On Earth, similar water lakes are known as karstic lakes. Occurring in in areas like Germany, Croatia and the United States, they form when water dissolves limestone bedrock. Alongside the investigation of deep lakes, a second paper in Nature Astronomy helps unravel more of the mystery of Titan’s hydrologic cycle. Researchers used Cassini data to reveal what they call transient lakes. Different sets of observations – from radar and infrared data – seem to show liquid levels significantly changed. The best explanation is that there was some seasonally driven change in the surface liquids, said lead author Shannon MacKenzie, planetary scientist at the Johns Hopkins Applied Physics Laboratory in Laurel, Maryland. “One possibility is that these transient features could have been shallower bodies of liquid that over the course of the season evaporated and infiltrated into the subsurface,” she said. These results and the findings from the Nature Astronomy paper on Titan’s deep lakes support the idea that hydrocarbon rain feeds the lakes, which then can evaporate back into the atmosphere or drain into the subsurface, leaving reservoirs of liquid stored below. Cassini, which arrived in the Saturn system in 2004 and ended its mission in 2017 by deliberately plunging into Saturn’s atmosphere, mapped more than 620,000 square miles (1.6 million square kilometers) of liquid lakes and seas on Titan’s surface. It did the work with the radar instrument, which sent out radio waves and collected a return signal (or echo) that provided information about the terrain and the liquid bodies’ depth and composition, along with two imaging systems that could penetrate the moon’s thick atmospheric haze. The crucial data for the new research were gathered on Cassini’s final close flyby of Titan, on April 22, 2017. It was the mission’s last look at the moon’s smaller lakes, and the team made the most of it. Collecting echoes from the surfaces of small lakes while Cassini zipped by Titan was a unique challenge. The Cassini-Huygens mission is a cooperative project of NASA, ESA (European Space Agency) and the Italian Space Agency. NASA’s Jet Propulsion Laboratory, a division of Caltech in Pasadena, California, manages the mission for NASA’s Science Mission Directorate, Washington. JPL designed, developed and assembled the Cassini orbiter. The radar instrument was built by JPL and the Italian Space Agency, working with team members from the U.S. and several European countries. In August of 2016, astronomers from the European Southern Observatory (ESO) announced the discovery of an exoplanet in the neighboring system of Proxima Centauri. The news was greeted with considerable excitement, as this was the closest rocky planet to our Solar System that also orbited within its star’s habitable zone. Since then, multiple studies have been conducted to determine if this planet could actually support life. Unfortunately, most of the research so far has indicated that the likelihood of habitability are not good. Between Proxima Centauri’s variability and the planet being tidally-locked with its star, life would have a hard time surviving there. However, using lifeforms from early Earth as an example, a new studyconducted by researchers from the Carl Sagan Institute (CSI) has shown how life could have a fighting chance on Proxima b after all. The study, which recently appeared in the Monthly Notices of the Royal Astronomical Society, was conducted by Jack O’Malley-James and Lisa Kaltenegger – a research associate and the director of the Carl Sagan Institute at Cornell University. Together, they examined the levels of surface UV flux that planets orbiting M-type (red dwarf) stars would experience and compared that to conditions on primordial Earth. The potential habitability of red dwarf systems is something scientists have been debating for decades. On the one hand, they have a number of attributes that are encouraging, not the least of which is their commonality. Essentially, red dwarfs are the most common type of star in the Universe, accounting for 85 percent of the stars in the Milky Way alone. They also have the greatest longevity, with lifespans that can last into the trillions of years. Last, but not least, they appear to be the most likely stars to host systems of rocky planets. This is attested to by the sheer number of rocky planets discovered around neighboring red dwarf stars in recent years – such as Proxima b, Ross 128b, LHS 1140b, Gliese 667Cc, GJ 536, the seven rocky planets orbiting TRAPPIST-1. For generations, scientists have struggled with questions regarding the habitability of planets that orbit red dwarf stars. Unlike our Sun, these low-mass, ultra-cool dwarf stars are variable, unstable and prone to flare-ups. These flares release a lot of high-energy UV radiation, which is harmful to life as we know it and capable of stripping a planet’s atmospheres away. This places significant limitations on the ability of any planet orbiting a red dwarf star to give rise to life or remain habitable for long. However, as previous studies have shown, much of this depends on the density and composition of the planets’ atmospheres, not to mention whether or not the planet has a magnetic field. To determine if life could endure under these conditions, O’Malley-James and Kaltenegger considered what conditions were like on planet Earth roughly 4 billion years ago. At that time, Earth’s surface was hostile to life as we know it today. In addition to volcanic activity and a toxic atmosphere, the landscape was bombarded by UV radiation in a way that is similar to what planets that orbit M-type stars experience today. To address this, Kaltenegger and O’Malley-James modeled the surface UV environments of four nearby “potentially habitable” exoplanets – Proxima-b, TRAPPIST-1e, Ross-128b and LHS-1140b – with various atmospheric compositions. These ranged from ones similar to present-day Earth to those with “eroded” or “anoxic” atmospheres – i.e. those that don’t block UV radiation well and don’t have a protective ozone layer. What this means, in essence, is that life could exist on neighboring planets like Proxima b right now despite being subjected to harsh levels of radiation. If you consider the age of Proxima Centauri – 4.853 billion years, which is roughly 200 million years older than our Sun – the case for potential habitability may become even more intriguing. The current scientific consensus is that the first lifeforms on Earth emerged a billion years after the planet formed (3.5 billion years ago). Assuming Proxima b formed from a protoplanetary debris disk shortly after Proxima Centauri was born, life would have had enough time to not only emerge, but get a significant foothold. As always, the search for life in the cosmos begins with the study of Earth, since it is the only example we have of a habitable planet. It is therefore important to understand how (i.e. under what conditions) life was able to survive, thrive and respond to environmental changes throughout Earth’s geological history. For while we may know of only one planet that supports life, that life has been remarkably diverse and has changed drastically over time. It was unprecedented. In 2017, astronomers discovered the first known interstellar object in our Solar System: ‘Oumuamua, a mysterious cigar-shaped enigma, identified as our first visitor from outer, outer space. But just because ‘Oumuamua was the first detected interstellar object, doesn’t mean it was the first ever. Just five years ago, in fact, Earth’s atmosphere was struck by something that may have originated far outside our own Solar System – and we never even realised it. In a new paper, a pair of Harvard researchers propose that a meteor that collided with Earth’s atmosphere in January 2014 was actually another interstellar traveller with distant, mysterious origins. But unlike the hurtling ‘Oumuamua – which is on a 20,000-year trajectory that will see it eventually exit our Solar System – this meteor’s long journey was fated to be a one-way ticket, ending with a fiery finale five years ago, as the object burnt up in the skies above Papua New Guinea. While ‘Oumuamua is a large object, and was detected very far from Earth, the team behind the meteor hypothesis says much smaller interstellar immigrants could be far more commonplace, and potentially exist a lot closer to home. “Instead of looking far out into space, and given the fact that there should be a higher abundance of interstellar objects smaller than ‘Oumuamua, we thought, ‘Why not look locally and find these smaller interstellar objects as they collide with the Earth’s atmosphere? '” first author, astronomer Amir Siraj told Newsweek. Working with Harvard astrophysicist Avi Loeb, Siraj pored through a catalogue of meteor impacts kept by NASA’s Centre for NEO Studies (CNEOS). Hidden in the CNEOS data, there lurked a remarkable outlier: a 2014 fireball that rushed Earthwards at a velocity of around 60 kilometres per second (37 mps) as it passed the Sun. We can be grateful that this object was quite small – less than a metre across in total – because if it were significantly larger, it could have made for a disastrous impact with Earth’s surface, rather than the harmless atmospheric fizzle that eventuated. But that happy anti-climax isn’t the primary takeaway of the meteor’s blistering speed. When Siraj and Loeb calculated the meteor’s orbital trajectory based on its velocity, their numbers suggested the object wasn’t orbitally bound to the Sun: it was travelling so fast before its fiery end, it slipped straight through the Sun’s gravitational pull. For that to be possible, the researchers suggest, the meteor had to originate from somewhere else, far beyond our Solar System. Per their calculations, the meteor’s speed “implies a possible origin from the deep interior of a planetary system or a star in the thick disk of the Milky Way galaxy”. It’s a wild idea, but while the findings remain purely hypothetical for now, Siraj and Loeb’s paper – which has not yet been peer-reviewed – has been welcomed by some in the astronomy community. “I think it is reasonable to conclude that this very high speed impactor came from the population of interstellar objects,” theoretical astrophysicist Kat Volk from the University of Arizona, who wasn’t involved with the study, told National Geographic. But while ‘Oumuamua’s discovery has definitely shifted the landscape, helping to make real the previously theoretical underpinnings of interstellar migrations, not everybody is yet convinced that this 2014 bolide held such a fantastic passport. “The result is interesting, but rests upon measurements for a single event,” astronomer Eric Mamajek from NASA’s Jet Propulsion Laboratory told Science News. The jury is still out on that one, but the hypothetical possibilities in this area of science are as beguiling as an invitation to trek beyond the stars. Per Siraj and Loeb’s calculations, these interstellar bolide events would have already occurred countless times in Earth’s history, and by looking out for future visits, we could learn much about these distant travellers’ backgrounds. “Future meteor surveys could flag incoming objects with excess heliocentric velocities for follow-up pre-impact observations,” the researchers write. Any way you look at it, amazing things are coming our way. The findings are available on the pre-print website arXiv, and have been submitted to the Astrophysical Journal Letters. It was the first molecule to form after the Big Bang. A flying observatory has pinpointed the first type of molecule that formed in the universe after the Big Bang. Helium hydride — a combination of helium and hydrogen — was detected roughly 3,000 light-years from Earth by NASA’s Stratospheric Observatory for Infrared Astronomy (SOFIA). The molecule was found in a planetary nebula, NGC 7027, which is the dusty remnant of a sun-like star. For hundreds of thousands of years after the Big Bang, the universe was too hot and too full of radiation for atoms to bond together. At that time, only a few types of atoms existed, including hydrogen, helium and lithium. However, the new study shows that 100,000 years after the Big Bang, the universe cooled enough for helium and hydrogen to combine, forming the molecule known as helium hydride. 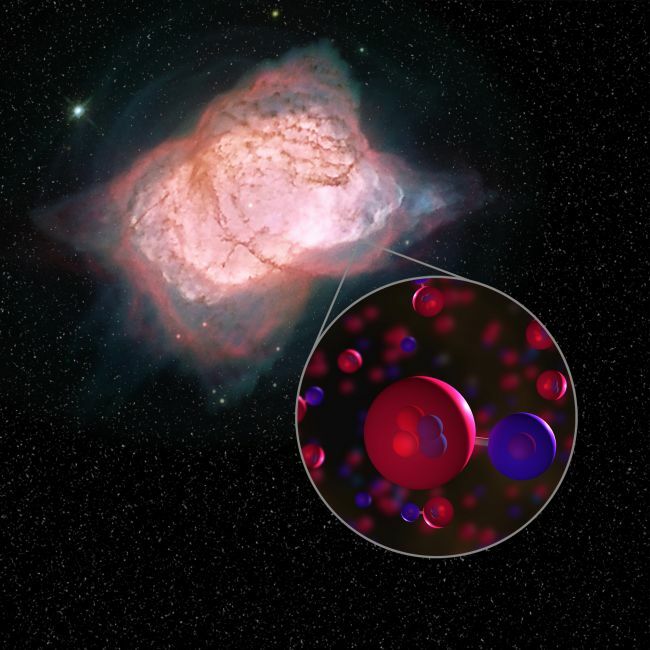 While helium hydride has been produced and tested in a laboratory setting, this discovery marks the first time that the molecule has been detected in space — which sheds light on the chemistry of the early universe, according to a statement from NASA. “This molecule was lurking out there, but we needed the right instruments making observations in the right position — and SOFIA was able to do that perfectly,” Harold Yorke, director of the SOFIA Science Center in California’s Silicon Valley, said in the statement. Once the universe cooled down, hydrogen atoms started to interact with helium hydride, creating molecular hydrogen, which set the stage for star formation. From that point on, stars created the other elements of the cosmos, according to the statement. “The lack of evidence of the very existence of helium hydride in interstellar space was a dilemma for astronomy for decades,” Rolf Guesten, lead author of the study from the Max Planck Institute for Radio Astronomy in Bonn, Germany, said in the statement. NGC 7027 has been a location of interest for helium hydride since the late 1970s. Ultraviolet radiation and heat from the aging star led scientists to believe that its environment would be suitable for helium hydride to form. However, astronomers were unable to confirm this theory until now. The SOFIA instrument is a telescope that is flown on a Boeing 747-SP airplane at up to 45,000 feet, where its observations are not impacted by interference from Earth’s atmosphere. SOFIA returns to Earth after every flight, allowing scientists to regularly update the instrument with the latest technology. One of the most recent upgrades included adding a specific channel to detect signatures of helium hydride, which previous telescopes did not have. “This flexibility allows us to improve observations and respond to the most pressing questions that scientists want answered,” Naseem Rangwala, SOFIA deputy project scientist, said in the statement. Their findings were published April 17 in the journal Nature. Final results of the crash investigation are expected in the coming weeks. A preliminary investigation into what caused Israel’s Beresheet spacecraft to crash-land on the moon April 11 puts the apparent blame on a “manual command” that was entered into the spacecraft’s computer. 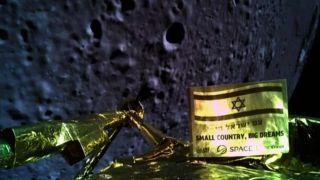 “This led to a chain reaction in the spacecraft, during which the main engine switched off, which prevented it from activating further,” according to a statement released today (April 17) by Beresheet’s handlers, the nonprofit group SpaceIL and the company Israel Aerospace Industries (IAI). Meanwhile, researchers are on the lookout for a NASA piggyback experiment that may have survived Beresheet’s destructive April 11 crash landing. NASA’s Lunar Reconnaissance Orbiter (LRO) will target the crash site repeatedly, eyeing the area with its high-powered cameras. In addition, LRO will use its onboard Lunar Orbiter Laser Altimeter (LOLA) in an attempt to detect a NASA-provided laser retro-reflector array in the Beresheet wreckage zone. Called the NASA Goddard Space Flight Center/MIT Laser Retroreflector Array(LRA) for Lunar Landers, the ball-shaped device was located on the top side of Beresheet. The size of a computer mouse, LRA is composed of eight mirrors made of quartz cube corners that are set into a dome-shaped aluminum frame. That array is lightweight, radiation-hardened and long-lived. While there will be many attempts to target the wreckage, LRO is directly over the site only twice per month, and one of those passes occurs in darkness (which is not an issue for the laser), explained the Massachusetts Institute of Technology’s David Smith, the principal investigator for LOLA and an emeritus researcher at NASA Goddard in Greenbelt, Maryland. “But the site can be viewed on several passes around the ‘overhead’ pass by looking off to the side or forward or backward. This requires the spacecraft to slew or roll to see the target,” Smith said. This is normal procedure, Smith said, but typically researchers need to submit pointing requests about a week in advance. That allows the LRO project to check on pointing abilities (there are limits) of LRO and on thermal effects and spacecraft solar array pointing for charging the batteries. “It may take 10 to 15 minutes for the spacecraft to turn to the desired direction and another 15 minutes to return to its normal nadir mode for just a few seconds of observations,” Smith told Inside Outer Space. At a speed of over 3,300 mph (5,310 km/h), the whole LRO observation period is over in a few seconds, Smith said. Leonard David wrote the forthcoming book “Moon Rush: The New Space Race,” to be published by National Geographic in May 2019. A longtime writer for Space.com, David has been reporting on the space industry for more than five decades. Follow us on Twitter @Spacedotcom or Facebook. The Facts:A document published by Wikileaks clearly implies that the United States had a “secret” base on the Moon that was destroyed by Russia. It’s one of many interesting documents that suggest strange things are and have been happening on the Moon. Reflect On:Is our world really as it’s been presented? There are millions of pages of documents that are classified by multiple countries every single year, how is it possible to really determine what’s going on behind the scenes? Why does secrecy rule? *Note from author: I recently published anarticle that goes into detail about what Julian Assange’s arrest tells us about our world. Unfortunately, the document is not an electronic document, therefore access to its full contents is not available online. For anybody truly interested in reading the entire thing, a Freedom of Information Act Request (FOIA) may be in order. So, what other information exists, besides this document, showing that something strange is and has been happening on the Moon? There’s a lot of information, so it’s hard to know where to begin. I also believe that we can and will achieve the goal set by Presidents Kennedy and Johnson: a manned landing on the moon before 1970. My own confidence in our rapidly advancing science and technology is such that I can visualize many more dramatic achievements ahead, although I will fix no timetable for them. 1. The exploration of the lunar surface, and possibly the establishment of one or more permanent bases there. Furthermore, decades old documents have been declassified discussing this topic, showing just how serious and far possible advancements with these intentions have gone. Take a look at the screen shot below, taken from the CIA electronic reading room in the form of a memorandum that was addressed to the CIA director regarding “Military Thought (Top Secret)” by Lieutenant General Korenevskiy. Dear John, Because the War in Space race is heating up, I felt you should be aware of several factors as you and I schedule our Skype talk. Remember, our nonviolent ETI from the contiguous universe are helping us bring zero point energy to Earth. They will not tolerate any forms of military violence on Earth or in space. The following information in italics was shared with me by my colleague Carol Rosin, who worked closely for several years with Wernher von Braun before his death. Carol and I have worked on the Treaty on the Prevention of the Placement of Weapons in Outer Space, attached for your convenience. A declassified report by the Air Force Nuclear Weapons Center from June 1959 shows just how seriously they considered a plan called Project A119. In general, they wanted to investigate the capability of weapons in space as well as gain further insight into the space environment and the detonation of nuclear devices within it. Interesting to say the least, but it’s important to recognize the intentions behind the letter, and that is the recognition that humans have brought and will continue to bring their destructive ways into space by weaponizing it or attempting to weaponize it. With all of this documentation, it’s also interesting to look into witness testimonies from credible sources. A spacecraft went to the rescue of Apollo 13, and they accompanied Apollo 13 on their voyage around the Moon back to Earth. And on two occasions they thought they might have to transfer the crew to their spacecraft, but they saw them safely back to Earth. This may explain why several astronauts have also been quite outspoken about an extraterrestrial presence, like Edgar Mitchell, Brian O’Leary, Story Musgrave, Gordon Cooper and many others. Keep in mind, this was more than 50 years ago. George Leonard’s 1976 book, Somebody Else is on the Moon, and Fred Steckling’s 1981 book, We Discovered Alien Bases on The Moon, also come to mind when discussing this subject. Members of the Society For Planetary SETI Research (SPSR) recently published a paper in the Journal of Space Exploration about certain features on the far side of the Moon that appear in the crater Paracelsus C. Titled “Image Analysis of Unusual Structures on the Far Side of the Moon in the Crater Paracelsus C,” it argues that these features might be artificial in origin. A decidedly conservative mainstream scientific establishment often rejects anomalies based on subject matter alone, i.e., there cannot be alien artifacts on the moon because there are no alien artifacts on the moon (or other planets). Such a view is an example of circular reasoning, based on the belief that extraterrestrials do not exist, or if they do exist that they could not have traveled to our solar system. When it comes to the Moon, man-made bases may not be the only ones there. A team of Israeli researchers has “printed” the world’s first 3-D vascularized, engineered heart. This is the first time anyone anywhere has successfully engineered and printed an entire heart replete with cells, blood vessels, ventricles and chambers,” said Prof. Tal Dvir of TAU’s School of Molecular Cell Biology and Biotechnology, Department of Materials Science and Engineering in the Center for Nanoscience and Nanotechnology, and the Sagol Center for Regenerative Biotechnology, who was the lead researcher for the study. He worked with Prof. Assaf Shapira of TAU’s Faculty of Life Sciences, and Nadav Moor, a doctoral student. Their research was published in Advanced Science. Heart disease is the leading cause of death among both men and women in the United States. In Israel, it is the second largest cause of death (after cancer). In 2013, heart disease accounted for about 16% of the total number of deaths in Israel, according to the Health Ministry. Heart transplantation is often the only treatment available to patients with end-stage heart failure. The waiting list for patients in the US can be as much as six months or more. In Israel and the US, many patients die while on the waiting list, hoping for a chance at survival. “People have managed to 3D-print the structure of a heart in the past, but not with cells or with blood vessels. Our results demonstrate the potential of our approach for engineering personalized tissue and organ replacement in the future,” he said. At this stage, the 3-D heart produced at TAU is sized for a rabbit, but the professors said that larger human hearts could be produced using the same technology. For the research, a biopsy of fatty tissue was taken from patients, according to a release. The cellular and a-cellular materials of the tissue were then separated. The cells were reprogrammed to become pluripotent stem cells that could then be efficiently differentiated into cardiac or endothelial cells. The extracellular matrix (ECM), a three-dimensional network of extracellular macromolecules, such as collagen and glycoproteins, was processed into a personalized hydrogel that served as the printing “ink.” The differentiated cells were then mixed with the bio-inks and were used to 3D-print patient-specific, immune-compatible cardiac patches with blood vessels and, subsequently, an entire heart. According to Dvir, the use of “native” patient-specific materials is crucial to successfully engineering tissues and organs. The next step, they said, is to teach the hearts to behave like human hearts. First, they will transplant them into animals and eventually into humans. The hope is that within “10 years, there will be organ printers in the finest hospitals around the world, and these procedures will be conducted routinely,” Dvir said. Lockheed Martin unveiled a design for a human-rated lunar lander that could be built quickly to meet Vice President Mike Pence’s challenge to return humans to the Moon by 2024. 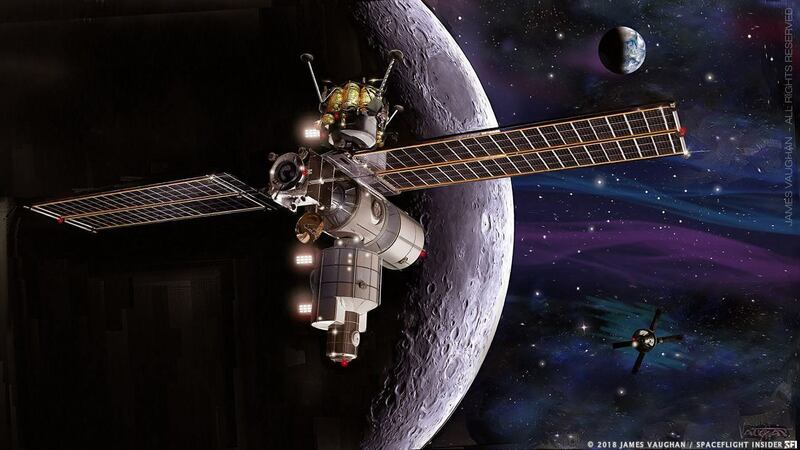 The two-stage lander concept was presented April 10, 2019, during the 35th Space Symposium in Colorado Springs, Colorado, where engineers from Lockheed Martin discussed ideas on how to accelerate lunar lander capabilities. NASA’s current plan to return humans to the Moon is expected in two phases, as outlined by the agency’s administrator, Jim Bridenstine, earlier this week. 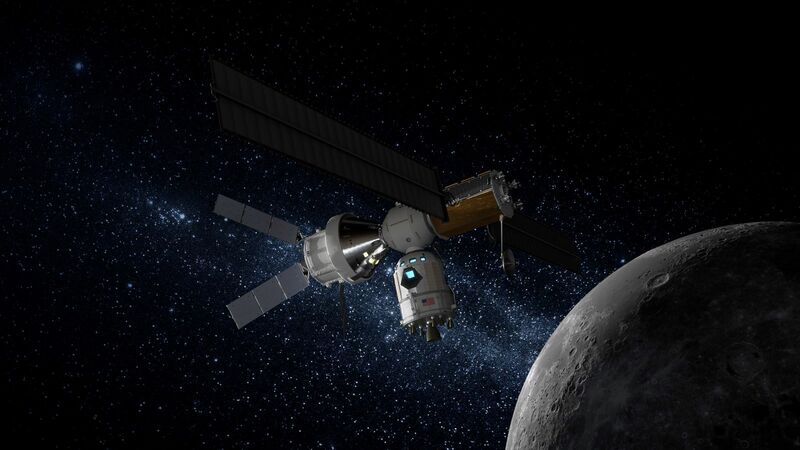 The first phase is about speed and involves building an initial Lunar Gateway (described as a reusable command module in orbit around the Moon) likely with just a power and propulsion module and a utilization module with docking ports. Ultimately, the Gateway is being designed to allow for Orion crews to dock and transfer to a reusable lunar lander architecture. It would also be in an orbit that requires little fuel to maintain while allowing for access to a large portion of the Moon’s surface. In the future, the vehicle is envisioned as being a rendezvous location for commercial resupply and refueling ships to replenish a reusable Moon exploration architecture. NASA envisions a three-part lunar lander system, built via public-private partnerships consisting of a transfer vehicle to travel to low-lunar orbit, a descent vehicle to land on the Moon and an ascent vehicle to return back to the Gateway. However, Lockheed Martin’s lander concept only requires two of those: the descent and ascent vehicles. Moreover, they are expected to be, in part, based off NASA’s Orion crew module, of which Lockheed Martin is the prime contractor. Orion is currently slated to launch atop NASA’s long-delayed Space Launch System as early as 2020. Known as Exploration Mission-1, it is expected to fly around the Moon before returning to Earth to test much of the spacecrafts systems. EM-2 is expected to follow as soon as 2022 and will be a full-up human flight, likely utilizing a free-return trajectory around the Moon. However, Lockheed Martin is proposing that it accelerate development on Orion’s docking hardware and software, including elements of design of the European service module, to allow for EM-2 to dock with the first modules of the Gateway, likely just the power and propulsion module and a utilization module with docking ports. 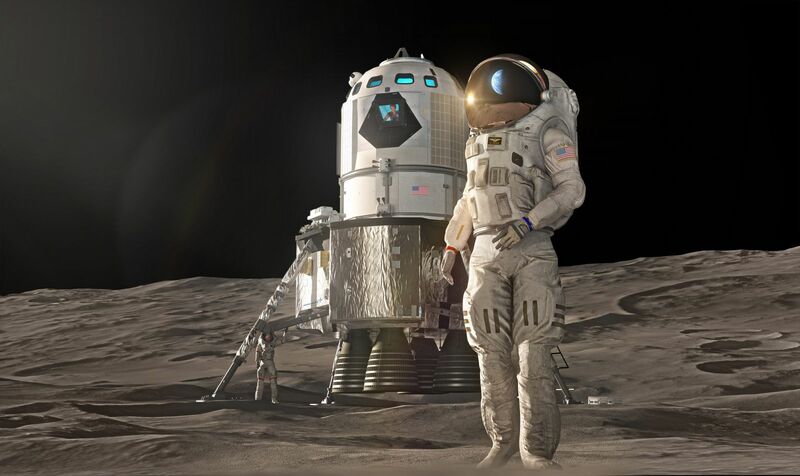 Those flights would test much of the hardware and software that would go into the proposed lunar lander, which the company would be developing in parallel, another key principle laid out by Bridenstine to allow for a speedy return to the Moon. EM-3, would then be freed to send a crew in 2024 to the Gateway where its lunar lander could be waiting for them to take at least part of the crew to the surface. Lockheed Martin said that for this plan to work on an aggressive five-year schedule, engineers would need to start “bending metal” next year. By late 2020, the focus would be on the avionics and software as a basis for systems testing and the beginning of crew training. Additionally, the company said resources from NASA—money—will be required for this to be built. According to Lockheed Martin, a robotic tech demo would be planned for between 2021 and 2022 in order to further reduce risk. Lockheed Martin has also been testing Gateway habitat prototypes at Kennedy Space Center since 2015 as part of NASA’s Next Space Technologies for Exploration Partnerships (NextSTEP) program. The company’s designs are based based on the Multi-purpose Logistics Modules, which were originally designed to provide logistics for the ISS. The prototype can be reconfigured for numerous missions. Several companies are contracted under this program, including Boeing, Northrop Grumman, Bigelow Aerospace, etc, but Lockheed Martin was the first to turn the prototype to NASA for testing. Engineers are studying how Orion and future habitats could dock with Gateway. Numerous systems are in the process of being designed and studied—including life support, radiation protection, thermal control, power, rendezvous, proximity, operations and docking, an airlock and communications—in order to determine which would work best in deep space. Gabriel 007 Posting publicly. What do you think about this movie? CAPE CANAVERAL, Fla. — SpaceX’s Falcon Heavy successfully launched its first operational mission today (April 11), sticking a triple-rocket landing more than a year after its demo mission catapulted a cherry-red Tesla and a dummy nicknamed Starman into space. The megarocket, dubbed the most powerful launcher in operation, blasted off at 6:35 p.m. EDT (2235 GMT). It lifted off here from the same site that once hosted NASA’s Apollo moon missions and its fleet of space shuttles: historic Pad 39A at NASA’s Kennedy Space Center. About 34 minutes later, the rocket deployed Arabsat-6A, an advanced communications satellite that will provide internet and communications services to residents of the Middle East, Africa and parts of Europe. Falcon Heavy’s second flight went off without a hitch at the beginning of a 2-hour window after high upper level winds thwarted SpaceX’s second launch attempt. A day earlier, Falcon Heavy faced a 24-hour delay due to poor weatherat the launch pad. A dismal weather forecast for Tuesday (April 9) convinced launch officials to issue a delay rather than face just a 30% chance of favorable weather. Today’s flight was the first of a Falcon Heavy launch featuring souped-up Block 5versions of its component rockets. (A Falcon Heavy rocket is built of three Falcon 9 first stages, which are combined to form the 27-engine megarocket.) As the rocket’s first-stage engines roared to life, they fired in unison and spewed smoke and fire around the launch pad. SpaceX made the transition to Block 5 for its Falcon 9 flights in May, after the demo flight of Falcon Heavy in February 2018. Today’s Falcon Heavy boasted more than 5 million lbs. of thrust, a 10% increase over its predecessor. To achieve that goal, engineers developed a suite of upgrades for the company’s flagship rocket. The design changes — including improved engines, a more durable interstage (the piece that connects the rocket’s two stages), titanium grid fins and a new thermal protection system — were developed to help the rocket better handle the stresses of launch. These technological advances have enabled the company to establish a growing fleet of flight-proven rockets. Falcon Heavy now has two spaceflights under its belt. Its first mission launched on Feb. 6, 2018, ferrying Elon Musk’s cherry-red Tesla Roadster — with a spacesuit-wearing test dummy named Starman sitting in the driver’s seat — into orbit. The nearly flawless first launch, which included successful landings by two of the Falcon Heavy’s three first-stage boosters, earned SpaceX major accolades. The enthusiasm carried over into today’s flight, as thousands of onlookers gathered in the area to watch the Falcon Heavy fly. With its first operational Heavy flight in the books, SpaceX is ready to forge ahead with a steady schedule of launches. The next Falcon Heavy flight, due to launch this year, will carry the Space Test Program 2 mission for the U.S. Air Force and a solar-sail mission for The Planetary Society. Falcon Heavy fetches a base price of $90 million per launch. Last June, SpaceX snagged a highly coveted military mission for the rocket — a $130 million deal to launch an Air Force Space Command satellite sometime in 2020. The Falcon Heavy is part of a growing list of SpaceX launch services and ongoing projects, which could include launching astronauts to the space station later this year during Crew Dragon‘s first crewed test flight. But Falcon Heavy won’t be the most powerful rocket in SpaceX’s arsenal for long. SpaceX is in the early stages of developing a launch system even larger than the Falcon Heavy. Just days before today’s launch, on April 5, the company hit the end of its tether on Starhopper, a test prototype for that massive rocket. That’s an initial stage of the company’s Starship program to design a fully reusable deep-space launcher for missions to the moon, Mars and beyond. The program already has its first passenger: SpaceX announced last September that Japanese entrepreneur Yusaku Maezawa has booked a trip around the moon that’s slated to fly no earlier than 2023. SpaceX’s next launch from the Cape is currently scheduled for April 26, when a Falcon 9 rocket will ferry a Dragon cargo capsule to the International Space Station. Scientists have obtained the first image of a black hole, using Event Horizon Telescope observations of the center of the galaxy M87. Scientists have released the first-ever image of a black hole, revealing the distant object in stunning detail. The groundbreaking discovery was made by the Event Horizon Telescope, an international project involving telescopes across the globe that describes itself as a “virtual Earth-sized telescope.” Telescopes in Hawaii, Arizona, Chile, Mexico, Spain and the South Pole participated in the ambitious research project. The black hole was spotted in galaxy Messier 87 (M87) that is 55 million light years away. A light year, which measures distance in space, equals 6 trillion miles. “This was a Herculean task,” explained National Science Foundation Director Dr. France Cordova, during the press conference, noting that the Event Horizon Telescope’s findings transform and enhance our understanding of black holes. The National Science Foundation has invested $28 million in Event Horizon Telescope project. The shadow of a black hole is the closest we can come to an image of the black hole itself, according to the EHT scientists. “The black hole’s boundary — the event horizon from which the EHT takes its name — is around 2.5 times smaller than the shadow it casts and measures just under 40 billion km [24.8 billion miles] across.,” the explain, in the statement. The SpaceX rocket expected to vault a Saudi communications satellite into orbit on April 10 is also auditioning to explore space with NASA. The Falcon Heavy rocket is the most powerful operational rocket in the world, designed to fly the largest satellites into the highest orbits over the earth. The communications satellite being flown in this launch, Arabsat-6A, weighs about six metric tons (6.6 tons). Though this is just the second flight of the rocket, a smooth mission could bring Elon Musk closer to his dreams of taking humanity out into the solar system. NASA has set a new goal of landing humans on the moon in 2024 that may require SpaceX’s help to achieve. The vehicle is effectively three of SpaceX’s reusable Falcon 9 boosters lashed together. It debuted with a Feb. 2018 flight that sent a Tesla roadster into orbit around the sun. SpaceX warned residents of the Florida coast that there are likely to be three large sonic booms when the three boosters return to earth after delivering the satellite. Arabsat-6A will be launched to an orbit roughly 36,000 km (22,369 miles) above the earth, where it will remain over Africa, the Middle East and Europe as it circles the earth. SpaceX is still showing NASA that its rockets are safe enough to fly astronauts to the International Space Station. A successful test run of that mission in March showed that the company’s Dragon spacecraft was capable of successfully flying to the ISS, docking with the orbital habitat, and then returning to earth to splashdown in the ocean. That means the company could actually launch a crewed flight later this year, pending a few other loose ends. One requirement is that the company fly seven times using an approved system of pressurized gas canisters in its rockets. Those canisters, known as composite overwrap pressure vessels or COPVs, were linked to a 2016 fire that destroyed a SpaceX rocket and satellite. SpaceX and NASA re-configured the system and have now flown it six times in the upper stage of the Falcon 9 rocket and twice in the reusable booster stage. This Falcon Heavy flight will feature the new COPVS in both stages of center booster, which could give NASA the data it needs to finally certify the design for human spaceflight. The Falcon Heavy earned global plaudits when it launched, but got a distinctly cool reception from the US space establishment, which has spent $17 billion on a Boeing-built heavy rocket called the Space Launch System (SLS) that faces lengthy delays. However, in March, NASA administrator James Bridenstine raised the possibility of keeping a planned lunar test of an uncrewed deep-space vehicle on schedule for 2020 by launching it on a commercially-available rocket like the Falcon Heavy instead of waiting for SLS. SpaceX’s rocket only has about 60% of the lifting power of the SLS, but it costs about one-tenth per launch thanks in part to its reusable boosters, and it is flying today. Using it for the moon mission would come with its own technical hurdles, like figuring out how to mate the spacecraft, called Orion, with the Falcon Heavy, and then to re-fuel it in orbit. It might be feasible, but only if the Falcon Heavy continues to demonstrate its capabilities with this launch and four others scheduled in the coming years. Musk, who says he wants to retire on Mars, has already launched the first private moon mission on a Falcon 9 rocket, an Israeli probe expected to touch down on the lunar surface on April 11. His company has also sold a flight around the moon to Japanese billionaire Yusaku Maezawa on the as-yet-unbuilt Starship space vehicle. In the 1960s animated sitcom The Jetsons, George Jetson commutes to work in his family-size flying car, which miraculously transforms into a briefcase at the end of the trip. A new study of the environmental sustainability impacts of flying cars, formally known as electric vertical takeoff and landing aircraft, or VTOLs, finds that they wouldn’t be suitable for a Jetsons-style short commute. However, VTOLs — which combine the convenience of vertical takeoff and landing like a helicopter with the efficient aerodynamic flight of an airplane — could play a niche role in sustainable mobility for longer trips, according to the study, scheduled for publication April 9 in Nature Communications. Several companies around the world are developing VTOL prototypes. Flying cars would be especially valuable in congested cities, or in places where there are geographical constraints, as part of a ride-share taxi service, according to study authors from the University of Michigan’s Center for Sustainable Systems and from Ford Motor Co.
“To me, it was very surprising to see that VTOLs were competitive with regard to energy use and greenhouse gas emissions in certain scenarios,” said Gregory Keoleian, senior author of the study and director of the Center for Sustainable Systems at U-M’s School for Environment and Sustainability. “VTOLs with full occupancy could outperform ground-based cars for trips from San Francisco to San Jose or from Detroit to Cleveland, for example,” he said. The U-M-Ford study, the first comprehensive sustainability assessment of VTOLs, looked at the energy use, greenhouse gas emissions and time savings of VTOLs compared to ground-based passenger cars. Although VTOLs produce zero emissions during flight, their batteries require electricity generated at power plants. The researchers found that for trips of 100 kilometers (62 miles), a fully loaded VTOL carrying a pilot and three passengers had lower greenhouse gas emissions than ground-based cars with an average vehicle occupancy of 1.54. Emissions tied to the VTOL were 52 percent lower than gasoline vehicles and 6 percent lower than battery-electric vehicles. Akshat Kasliwal, first author of the study and a graduate student at the U-M School for Environment and Sustainability, said the findings can help guide the sustainable deployment of an emerging mobility system prior to its commercialization. In the coming decades, the global transportation sector faces the challenge of meeting the growing demand for convenient passenger mobility while reducing congestion, improving safety and mitigating climate change. Several aerospace corporations and startup companies — Airbus, Boeing, Joby Aviation and Lilium, for example — and agencies such as NASA have developed VTOL prototypes. One critical efficiency enabler for these aircraft is distributed electric propulsion, or DEP, which involves the use of several small, electrically driven propulsors. The U-M and Ford researchers used publicly available information from these sources and others to create a physics-based model that computes energy use and greenhouse gas emissions for electric VTOLs. “Our model represents general trends in the VTOL space and uses parameters from multiple studies and aircraft designs to specify weight, lift-to-drag ratio and battery-specific energy,” said Noah Furbush, study co-author and a master’s student at the U-M College of Engineering. “In addition, we conducted sensitivity analyses to explore the bounds of these parameters, alongside other factors such as grid carbon intensity and wind speed,” said Furbush, who is also a member of the U-M football team. The study began while Kasliwal and Furbush were summer interns at Ford. The work continued when the students returned to Ann Arbor, with the help of a Ford-University of Michigan Alliance grant. The researchers analyzed primary energy use and greenhouse gas emissions during the five phases of VTOL flight: takeoff hover, climb, cruise, descent and landing hover. These aircraft use a lot of energy during takeoff and climb but are relatively efficient during cruise phase, traveling at 150 mph. As a result, VTOLs are most energy efficient on long trips, when the cruise phase dominates the total flight miles. But for shorter trips — anything less than 35 kilometers (22 miles) — single-occupant internal-combustion-engine vehicles used less energy and produced fewer greenhouse gas emissions than single-occupant VTOLs. That’s an important consideration because the average ground-based vehicle commute is only about 17 kilometers (11 miles). Not surprisingly, the VTOL completed the base-case trip of 100 kilometers much faster than ground-based vehicles. A point-to-point VTOL flight path, coupled with higher speeds, resulted in time savings of about 80 percent relative to ground-based vehicles. “Electrification of aircraft, in general, is expected to fundamentally change the aerospace industry in the near future,” Furbush said. The study’s authors note that many other questions need to be addressed to assess the viability of VTOLs, including cost, noise and societal and consumer acceptance. London, England. Credit: GoogleA British witness at London reported watching a black, triangle-shaped object “about two-to-three times the size of an A380 passenger jet moving overhead, according to testimony in Case 92298 from the Mutual UFO Network (MUFON) witness reporting database. The witness and his wife were standing in their backyard having a cigarette at 11:30 p.m. on May 1, 2018. The witness said the object was about two-to-three times the size of an A380 passenger jet. United Kingdom MUFON Field Investigator Karl Webb closed this case as an Unknown Aerial Vehicle. A hypersonic ‘spaceplane’ just passed a crucial test for its precooler component. If and when the jet becomes available for commercial use, it could fly people from London to New York in less than 60 minutes. A ‘spaceplane’ that flies 25 times faster than the speed of sound has successfully passed a crucial testing milestone. The hypersonic plane is so fast it could jet from London to New York in less than 60 minutes and transport you from the UK to Australia in four hours. Oxford-based Reaction Engines has been working with the European Space Agency and the UK Space Agency, along with BAE Systems, to make the powerful aircraft. Reaction Engines has recently been testing a ‘pre-cooler’ for the plane, which is technology that would allow it to travel faster than ever before. The pre-cooler is critical in the plane’s development because it is required to stop the engine from melting by lowering the temperature of compressed air in the engine from more than 1,000°C to room temperature in one-twentieth of a second. Thousands of tubes inside the pre-cooler, which are thinner than human hair, contain liquid helium that can cool the air as it rushes past them. Until now, heat has been a limiting factor for how fast aircraft can travel, including Concorde which traveled at two times the speed of sound. This technology could now be combined with the spaceplane’s experimental engine, referred to as Sabre. Sabre is intended to be much lighter than a conventional rocket engine because it would carry less fuel-oxidant. It is being designed to draw oxygen into the engine to use for combustion from take off until it reaches just over 4,000 mph. After this point, the engine would need to burn liquid oxygen and liquid hydrogen from on-board fuel tanks. The spaceplane would need to continue using this process until it reached 25 times the speed of sound to enter space. The company ultimately aims to create a reusable vehicle that has the fuel efficiency of a jet engine with the power of a rocket. Plans for the hypersonic plane don’t just include getting people around the world in a fraction of the time but also taking people or cargo into Space and back for just a fraction of the current cost. Felicity Huffman has agreed to plead guilty in the college admissions cheating scam that has ensnared wealthy parents, Fox News has learned. On Monday, the 56-year-old actress announced her decision, explaining that she accepts “full responsibility” for her actions. “I am pleading guilty to the charge brought against me by the United States Attorney’s Office,” the “Desperate Housewives” alum said in a statement obtained by Fox News. “I am in full acceptance of my guilt, and with deep regret and shame over what I have done, I accept full responsibility for my actions and will accept the consequences that stem from those actions,” Huffman continued. “I am ashamed of the pain I have caused my daughter, my family, my friends, my colleagues and the educational community. I want to apologize to them and, especially, I want to apologize to the students who work hard every day to get into college, and to their parents who make tremendous sacrifices to support their children and do so honestly. “My daughter knew absolutely nothing about my actions, and in my misguided and profoundly wrong way, I have betrayed her. This transgression toward her and the public I will carry for the rest of my life. My desire to help my daughter is no excuse to break the law or engage in dishonesty,” she concluded. The Department of Justice revealed on Monday that Huffman was one of the 11 defendants, who was charged with one count of conspiracy to commit mail fraud and honest services mail fraud, and have agreed to plead guilty pursuant to plea agreements. In addition, two other defendants, who are facing other charges, both agreed to plead guilty to one count of conspiracy to commit mail fraud and honest services mail fraud, federal prosecutors said. The former head coach for the men’s tennis team at the University of Texas at Austin was also charged and has agreed to plead guilty to one count of conspiracy to commit mail fraud and honest services mail fraud. Last week, Huffman appeared in a Boston federal court. She is accused of paying $15,000 disguised as a tax-deductible charitable donation so her daughter could take part in an apparently rigged college entrance exam. Court documents stated that a cooperating witness met with the actress and her husband, “Shameless” star William H. Macy, at their Los Angeles home and explained to them that he “controlled” a testing center and could have someone secretly alter her daughter’s answers. The person told investigators the couple agreed to the plan. Huffman was arrested and released on a $250,000 bond last month. Macy was not charged. More than four dozen people have been charged in the nationwide scam, which is alleged to have placed students in top-tier schools like Yale, Georgetown, Stanford, the University of Southern California, UCLA and the University of Texas. A federal investigation into the matter – dubbed “Operation Varsity Blues” – has been ongoing for more than a year. Fellow actress Lori Loughlin and Loughlin’s fashion designer husband, Mossimo Giannulli, are also charged in the scam. They are not among those who’ve agreed to plead guilty and haven’t publicly addressed the allegations. Sen. Kamala Harris, D-Calif, is now backtracking after saying “we should have that conversation” of allowing criminals currently in prison like the Boston Marathon bomber to vote. The U.N. says Afghan and international forces killed more civilians than insurgents in the first three months of the year, the first time the deaths caused by the government and its allies exceeded their enemies. The Latest on the sentencing of Hong Kong protest organizers (all times local): 11:40 a.m.
More than 350 people were killed in bombings of churches and hotels in Sri Lanka on Easter Sunday. Japan's government has apologized to tens of thousands of victims forcibly sterilized under a now-defunct Eugenics Protection Law and promised to pay compensation. Several puppies who were tossed in a dumpster in California on a scorching day last week may not have been found had it not been for a homeless man digging for bottles to recycle. Another Game 7 matchup between Boston and Toronto, another victory for the Bruins. Ben Simmons thumped his chest after a big dunk, Joel Embiid pointed toward an overmatched defender on a slam of his own, and the Philadelphia 76ers flexed their offensive muscle from the opening tip to beat the Brooklyn Nets 120-100 on Tuesday night and close out their Eastern Conference playoff series in five games. Scientists completed one of the most detailed explorations inside the Great Blue Hole. Here's what they found at the bottom of the giant, mysterious sinkhole. Researchers report on the observation of supersolid behavior in dipolar quantum gases of erbium and dysprosium. In the dysprosium gas these properties are unprecedentedly long-lived. This sets the stage for future investigations into the nature of this exotic phase of matter. Researchers demonstrate that genetically identical cells exhibit differing responses in their motility towards chemical attractants. Average values hide the full picture when it comes to describing the behavior of bacteria. There appears to be an underlying selection mechanism at work among Gouldian finches -- a mechanism that allows this species to produce and maintain individuals with red heads, black heads, and yellow heads. Research uses functional MRI to identify two differences in the brains of blind individuals -- differences that might be responsible for their abilities to make better use of auditory information. Researchers from the Harvard John A. Paulson School of Engineering and Applied Sciences (SEAS) have developed a new and improved snake-inspired soft robot that is faster and more precise than its predecessor. Synthetic biologists have added high-precision analog-to-digital signal processing to the genetic circuitry of living cells. The research dramatically expands the chemical, physical and environmental cues engineers can use to prompt programmed responses from engineered organisms. The American Bumblebee - a species once more commonly seen buzzing around Southern Ontario - is critically endangered, according to a new study. The finding found the native North American species, Bombus pensylvanicus, is facing imminent extinction from Canada, considered the highest and most at-risk classification before extinction. The iconic 'death roll' of alligators and crocodiles may be more common among species than previously believed, according to a new study.